The north west of England taking in what we know today as Manchester, Lancashire and part of Yorkshire. As with so many tribes in Britain, the Brigantes were closely aligned with a tribe of similar name in Europe. It is not known whether the Brigantes in Europe settle in Britain, or vice versa. But it can be safely assumed the latter is the case. Indeed the name 'Brigantes' is translated as 'The People of Brigit'. They were large in area and most probably were a series of tribes that had amalgamated into a single unit prior to the Roman invasion. 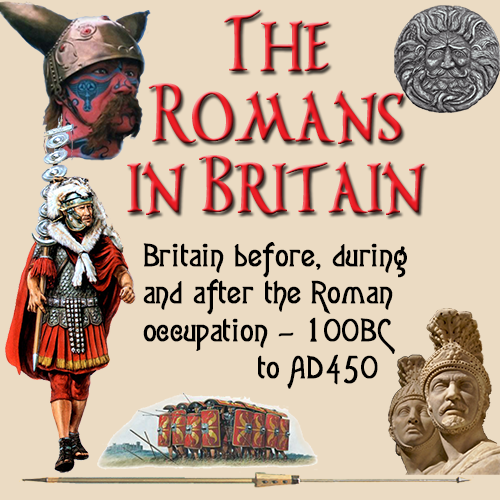 As is the case with most of pre-Roman Britain, no recordings were made of life and events. Most of of knowledge of Britain before the Romans has been gleamed from coins found and the odd writing unearthed over the years. A test of Cartimandua's loyalty to emperor Claudius in Rome came after the defeat of the British warlord in mid-Wales by the Roman legate Ostorius Scapula. Caratacus himself ... after seeking the protection of the Brigantian queen Cartimandua, was arrested and handed to the victors, in the ninth year from the opening of the war in Britain. ..."
Following the betrayal of Caratacus, dissentions were being voiced, particularly it would seem, from Venutius, the prince-consort of Cartimandua. " It is clear that relations between the royal couple had deteriorated , in the intervening years, for the queen was to have a scandalous affair which was to rock the Brigantian court, and led to the governor, Vettius Bolanus, being replaced by a more forceful general. Inspired by these differences between the Roman forces and by the many rumours of civil war that reached them, the Britons plucked up courage under the leadership of Venutius, who, in addition to his natural spirit and hatred of the Roman name, was fired by his personal resentment toward Queen Cartimandua. She was ruler over the Brigantes, having the influence that belongs to high birth, and she had later strengthened her power when she was credited with having captured King Caratacus by treachery and so furnished an adornment for the triumph of Claudius Caesar. From this came her wealth and the wanton spirit which success breeds. She grew to despise her husband Venutius, and took as her consort his squire Vellocatus, whom she admitted to share the throne with her. Her house was at once shaken by this scandalous act. Her husband was favoured by the sentiments of all the citizens; the adulterer was supported by the queen's passion for him and by her savage spirit. So Venutius, calling in aid from outsid and at the same time assisted by a revolt of the Brigantes themselves, put Cartimandua in an extremely dangerous position. Then she asked the Romans for protection, and in fact some companies of our foot and horse, after meeting with indifferent success in a number of engagements, finally succeeded in rescuing the queen from danger. The throne was left to Venutius; the war to us. Bremetenacum Veteranorum - (Ribchester, Lancashire) - A number of Sarmatian veterans weresettled here, probably by Antoninus Pius following a Brigantian revolt mentioned by Pausanias. Calcaria - (Tadcaster, North Yorkshire) - Assigned to the Brigantes in the Itinerary and the Cosmography. Lugvualium - (Carlisle, Cumbria) - Town. Coriosopitum - (Corbridge, Northumberland) - Major settlement. Adel (nr. Leeds, West Yorkshire) - Small civil settlement. Thornton le Street (North Yorkshire) - Posting station. Whitby (North Yorkshire) - Votive carvings and personal ornaments werecollected from the beach here. No settlement has been identified. Well (North Yorkshire) - An interesting villa, whose bath-house may have become a local shrine. Stanwick (North Yorkshire) - This is the only known lowland site akin to the oppida of southern England. Cartimandua One of only two British women to be mentioned in the ancient sources, the other was Boudicca. she was the leading noble of the Brigantian tribe who was probably granted a clientship with Rome in 43AD, along with her consort Venutius. During the spring of 48AD, political pressure from certain rebels within the Brigantian upper classes forced Scapula to abandon his campaign against the Ordovices in north Wales, and turn his attention to the Brigantes. Cartimandua captured the Catuvellaunian leader Caratacus, then honoured her agreement with Rome by surrendering him to Scapula. This action seems to have instigated resentment towards the rule of Cartimandua within the Brigantes, which for a period, lurked beneath the surface of the seemingly calm tribal period. In 53AD, Venutius divorced Cartimandua and formed a sub-tribe of his own, attacking Cartimandua's base and causing the new Roman governor, Aulus Didius Gallus to send a number of auxiliary cohorts to her aid. Cartimandua continued to rule the Brigantes for a number of years with her own armour-bearer, Vellocatus, as her consort. However, the discontent was still growing in the ranks of the Brigantian rulers for another rebellion occurred during the governorship of Marcus Vettius Bolanus around 70AD. During this uprising, Cartimandua had to be rescued by an ala of Roman auxiliary cavalry sent specifically for this purpose by the governor who was occupied against the Silures in south Wales. This continuing Brigantian unrest caused the emperor Vespasian to ceasel the clientship of the Brigantes and they came under the direct rule of Rome. Venutius Was the consort of Queen Cartimandua, possibly since before she became a client of Claudius in 43AD. All was not well, for during the governorship of Aulus Didius Gallus, sometime between 52AD and 57AD, he divorced her. Cartimandua's treatment of Caratacus in 51AD could have been one possible reason for his decision. Whatever the cause, Venutius proceeded to wage war on his ex-spouse with his own rival Brigantian people. The new governor was forced to send several cohorts to her aid, until the forces under the command of Venutius were eventually defeated in a final battle. Vellocatus The shield-bearer of Cartimandua, who became her lover after her consort Venutius divorced her, around 55AD. He lived possibly until after 70AD when another Brigantian rebellion forced Cartimandua to seek the protection of the Roman governor, leading to the ending of the clientship and the start of direct rule by Rome.